The owners, John and Joyce Lee, will always greet you with a smile when you visit their family-owned and operated business. Advantage Graphics, Inc. was founded in 1997 as a graphic design and full commercial printing company to assist small, medium and large business with their design and printing needs. Over the last decade, we have grown and expanded into a company that not only can assist you with your graphic design needs, but can also take your project from idea to completion. Advantage Graphics takes pride in offering the highest quality products at the best value in the printing industry. Everyday hundreds of businesses trust Advantage Graphics with their design and printing needs, reinforcing the Advantage tradition of industry-leading quality assurance, top notch reliability, cost effective prices and unsurpassed customer service. 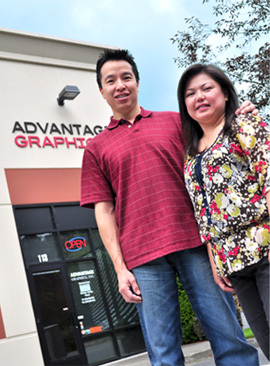 John and Joyce Lee, owners of Advantage Graphics, look forward to assisting you with your design and printing needs. Call or come in to see us today! © 2019 AgiPrintCopy.com Printing and Graphics.